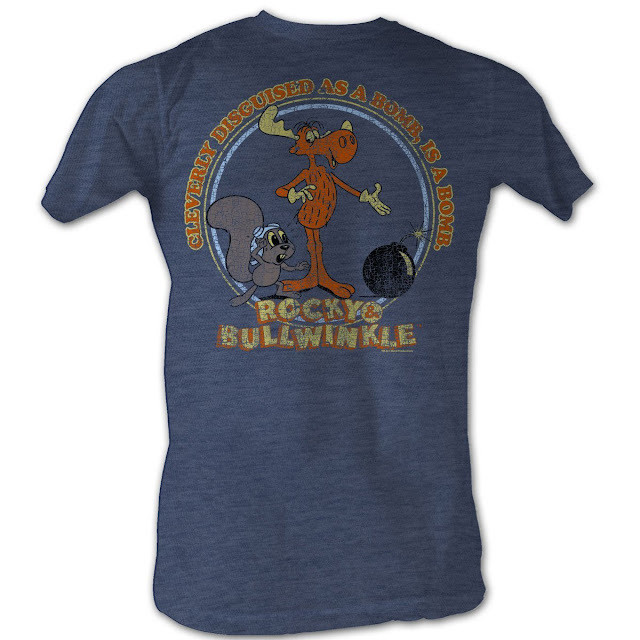 This funny Rocky and Bullwinkle shirt reads "Cleverly disguised as a bomb, is a bomb." Available for men. You can buy this shirt here. Though Bullwinkle takes center stage in this shirt, he wouldn't be anything without trusty Rocky the Squirrel at his side. They both contemplate the bomb in the lower right of the design. Bullwinkle gladly demonstrates its "disguise" while clever Rocky looks on in alarm. Perfect whether you love retro cartoons, are a Rocky and Bullwinkle fan, or just like to see a squirrel shirt that's grounded in pop culture. The design itself is well composed; A faux-weathered texture adds to its appeal.